Phil discusses branch bark collars and where to make proper ‘thinning’ pruning cuts to open fruit trees to more air and light. POP kicked off its 2017 season on Jan. 28th with a sold-out class on winter pruning held at Awbury Arboretum’s Agricultural Village. Executive Director Phil Forsyth led off with a presentation on pruning and the techniques and tools most appropriate by species — whether stone fruits like peaches, plums, cherries, and apricots, pome fruits like apples and pears, fruiting bushes, vines, or rambling brambles — blackberries and raspberries. 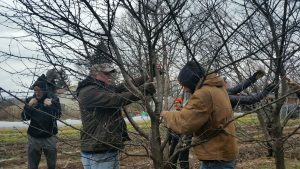 The second portion of the workshop brought participants, armed with hand pruners, loppers, pole pruners and saws, out to test what they learned. We pruned a row of pie cherry trees on the border of the Teens Leadership Program farm and then moved through POP’s demonstration food forest orchard, tending to the assortment of plantings. Now cleared of diseased and damaged wood, and competing, crossing, or vigorously grown branches from the previous year’s growth, the pruned plants will be more productive and structurally sound for the season to come. Pruning helps maintain the health and vigor of plantings through the removal of branches and manipulation of buds. Good pruning helps fruiting trees, shrubs and vines remain more resistant to pests and disease, as well as bear a larger, more consistent, and better quality harvest. 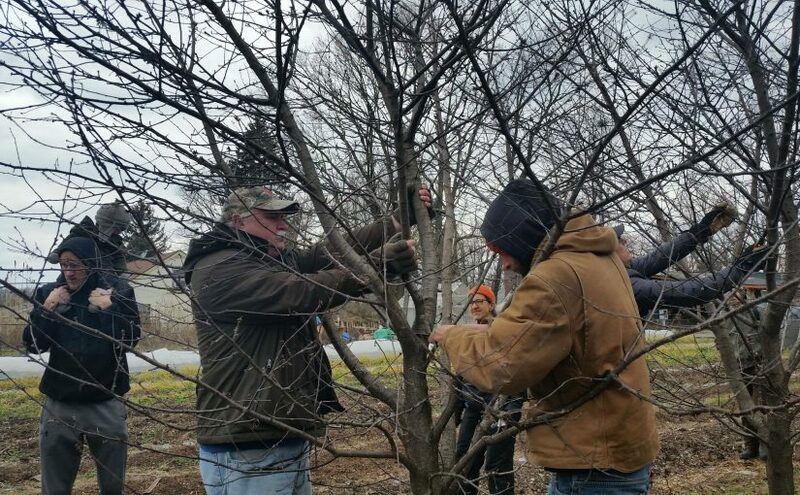 While damaged, diseased wood, suckers at the base of the tree, and watersprouts can be pruned in any season, most orchard pruning is best completed during the dormant season, before the buds begin to swell, and preferably on a day when the temperature is above freezing (late January through early March) – with the exception of peaches (which should be pruned after they bloom). For specific information on pruning and shaping methods and the basic structure of trees, consult POP’s Pruning Guide for Young Fruit Trees here along with other printable resources for tending to your orchard plantings from our POP Handouts and Resource guide. Eager to learn more? 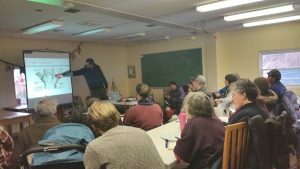 Look out for next month’s workshop on Fruit Tree Grafting at Bartram’s Garden on March 11th from 10am-1pm, and this year’s new Community Orchardist Training Program kicking off Wednesday evenings in March at Bartram’s Garden! SUPPORT US! If you found this entry useful, informative, or inspiring, please consider a donation of any size to help POP in planting and supporting community orchards in Philadelphia: phillyorchards.org/donate.